Gaming is more than just a hobby. To veterans that have fought overseas, they can often provide valuable peace of mind. Shacknews spoke to Stack-Up.org founder and CEO Stephen 'Shanghai Six' Machuga to learn about how this charity helps bring video games to veterans that need it the most. Today is a day to honor this nation's veterans, who have proudly served the United States of America. And just like everybody else, our nation's soldiers enjoy a good video game every now and then. 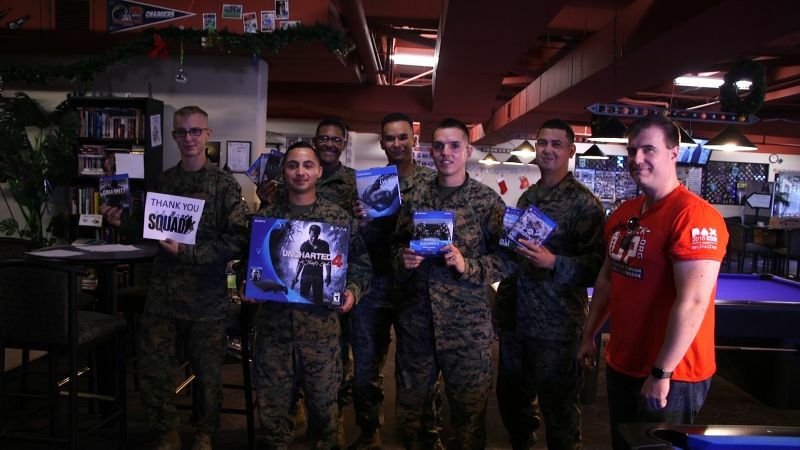 There's one charity out there that seeks to bring gaming to soldiers either coming home after a harrowing tour of duty or bravely serving abroad. That charity is Stack-Up.org, specifically founded with veterans in mind. In addition to supplying games to United States soldiers, this charity also supports allied troops in NATO, Australia, and New Zealand. For this Veterans Day, Shacknews spoke to Stack-Up.org founder and CEO Stephen "Shanghai Six" Machuga to learn more about the charity's day-to-day mission. Shacknews: Tell me about Stack-Up.Org. For anyone unfamiliar with your charity, what is your mission statement and how did Stack-Up.Org get started? Stephen "Shanghai Six" Machuga, Founder & CEO: We are a military charity supporting US and Allied veterans with gaming and geek culture. After I got out of the Army, I wanted to continue my service to my fellow men and women of the armed forces, and they say that you should do what you know, so I went right to video gaming! A buddy of mine who was in the same gun truck as I was in Iraq had gotten out and then re-enlisted after he found the civilian world lacking... and then immediately got sent over to Afghanistan. He knew I had some connections in the games industry at the time and asked if I could get his unit an Xbox or something as they were deployed in the middle of nowhere and with very little to do. We got a pile of donations from the games industry, so when I shipped it over, the units around my friend all started sending in questions as to how they could get similar care pacakges. Next thing you know, I'm acting as an intermediary between these units and game developers and publishers! It started taking up more and more of my time on the weekends, but over time, I saw that this veteran targeted "luxury care package" service I was providing had a much more lasting benefit to the troopers that we were helping. Shacknews: In what ways has Stack-Up.Org grown in the past two years since its inception? Machuga: We've grown in leaps and bounds. We've had some major supporters within the games space; as wonderful as all of the video game charities are out there, no one was servicing the troops, so Stack-Up has filled that void quite nicely. Shacknews: How often do you get new streamers volunteering to help and how have they able to positively affect the charity's mission? Machuga: Streamers are an absolute critical part of our mission. Between massive fundraising streams and raising awareness through social media campaigns, they become our defacto mouthpiece to their audience. It turns out that everyone has either served or knows someone who has served, so this is a great way for us to reach out to gaming veterans as well. Shacknews: How do Supply Crates work? How do you supply them and how are you able to get them shipped out to where they need to go? Machuga: Supply crates are what started it all. Simply put, they're boxes full of everything a unit needs to get gaming wherever they are at, whether it's a wounded vet recovering in a military hospital somewhere, a unit stationed downrange away from the comforts of a major logistic hub, or even military drug and alcohol rehab centers and homeless shelters. Anywhere where we can keep veterans morale up so they're not thinking about the situation they might find themselves in, that's where we try to be. We get wish lists from various units and individuals globally and whatever we can't get donated, we end up buying thanks to our generous donors. Shacknews: Why are video games particularly helpful to those either coming home from a long deployment or those soldiers who don't know when they're coming home? Machuga: If you've ever got up from a three-hour movie and thought, "Wow, that felt like 20 minutes! ", then you know the benefit of a good gaming session. Gamers know the "just-one-more-turn" mentality of a good turn based strategy game like Civilization or XCOM and then they find that they spent all night gaming as the sun is coming up. That is a level of escapism that veterans usually find at the bottom of a bottle, whether alcohol or pills, and a lot of veterans have a tough time dealing with being home after deployment or even getting out of the service, and gaming is the therapy that a lot of these men and women would like to involve themselves in. Shacknews: TwitchCon recently offered a panel in which veterans got to share their military and gaming experiences. What's one of the most memorable stories you've heard from a veteran about their military experience and gaming? Machuga: We had a member of the Israeli Defense Force telling us stories about how he was streaming to Justin.tv while he was in while he was under mortar attack from the Palestinians. That's the world we're in now; there's a part of me that is glad I missed out on a military world where everyone has pocket computers with high speed internet connections. Shacknews: How can the average person help Stack-Up.Org's cause? Machuga: Head on over to the site, there's a button at the top marked "How to Help." Click there and there's a variety of options for people looking to get involved, whether donating time, money, or even just some social media love. Shacknews: What's next for Stack-Up.Org? Machuga: Veterans Day is almost here, so we're full court press with our bi-annual fundraiser, the "Call to Arms"; this year, our highlighted dev team is the Ubisoft Rainbow Six: Siege team helping us out. However, 2018 has a lot in store for us, starting with us moving the organization to the heart of the beast, Los Angeles! Between all the opportunities along the West Coast in the games industry, having the charity on the East Coast is no longer tenable, as we continue to grow our influence. Be sure to keep up with Stack-Up.org's efforts to support veterans by following them on Twitch, where the charity is taking donations daily, and also keep up wtih what's next on the charity's Twitter. Thats really awesome. 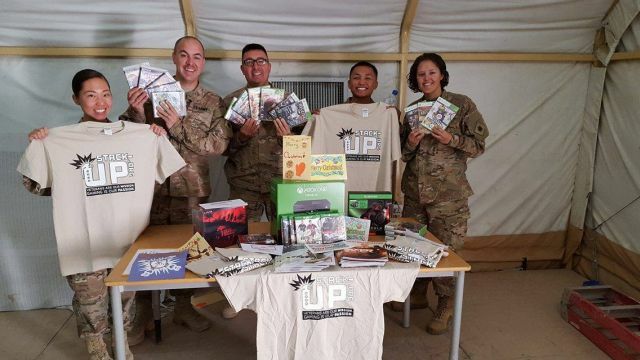 I was in Afghanistan in 2013 and we got a huge donation of a 50 inch TV, Xbox, PS4, and a ton of games. Plus two leather couches. I dont remember who organized it but it was amazing for our morale. oh cool. thanks for the retweet.